Last July, Skillshare teamed up with legendary streetwear designer and Founder of Staple Design, Jeff Staple to host a Build Your Brand Workshop for aspiring fashion and lifestyle designers. More than 830 people took the three-class workshop and learned how to create a shirt, a headwear piece, and creative packaging in just three short weeks. But we thought, why stop there? Maybe we could take the opportunity to give a small group of great students an even bigger leg-up into the industry of their dreams. Working with Jeff Staple, we selected the teams behind six of our favorite workshop brand projects and flew them to Las Vegas so that they could show their goods at the premiere international streetwear trade convention, Agenda Show. While they were there, we gave them the chance to meet hundreds of prospective buyers, mingle with industry peers and to meet Jeff for some crucial (and well-earned!) one-on-one time. Oh, and just in case that wasn’t enough? We gave each finalist the chance to win up to $10,000 while they were at the Agenda Show so that they could continue to build their brands even after they returned home. They say what happens in Vegas stays in Vegas, but we had too much fun to keep these details to ourselves. Check out our behind-the-scenes look at Skillshare and Jeff Staple’s biggest class trip yet! Six teams meet at Las Vegas after flying in from as far away as Sydney Australia to participate in the Agenda Show with Skillshare and Jeff Staple. 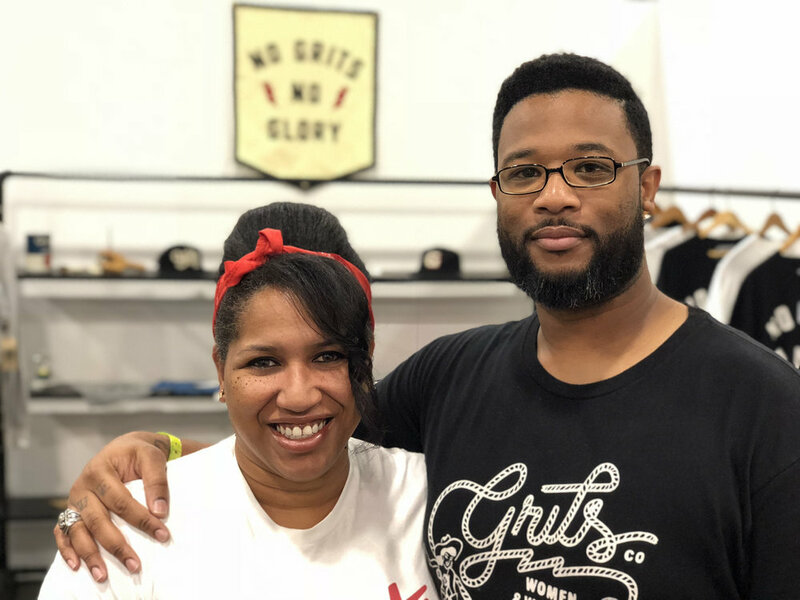 Phillip Jarrett sets up his West Palm Beach-based brand project, Ziptiez, before his booth is visited by prospective buyers. Workshop students Tyler Bowman and Daiana Vernon in their Agenda Show display for their Charleston-based fashion and lifestyle brand, M A N A L L.
Workshop student Ed Cunningham hangs items for his brand, DAYSWORK, a line that he says is inspired by the innovation, quality, and authenticity of the industrial working class of the 1900s. New York- based Skillshare student Chris Frangoulis sets up his booth for his brand Maroon NYC, an homage to Americana and the classic brands’ influence on New York streetwear. Skillshare students and Husband-and-Wife team Reuben and Toya Levi traveled from Houston, TX to represent their brand, Grits, Co. at the Agenda Show. In just a few years, they’ve built a loyal group of fans –including musician Leon Bridges! – with their “No Grits, No Glory” tagline, and their brand’s signature vintage look. Legendary designer and Build Your Brand Workshop teacher Jeff Staple shares a toast with the workshop finalists at a dinner in their honor. Industry crowds gather at Skillshare student booths to chat with designers about their brands. Staple evaluates M A N A L L's brand design as he considers who should win the top prize. Staple has taught six classes on branding and design for Skillshare. He says that helping younger designers, through mentorship and education is one of his most enduring professional passions. DAYSWORK’s team Ben Murphy, Ed Cunningham and George Cunningham meet with Staple to discuss their brand. They say that Skillshare has been a useful way to take creative and design classes, improve their technical skills and stay current on trends. Staple addresses the crowd in a ceremony to award the winning teams with funds to continue their efforts. After putting it to a vote, the Skillshare students unanimously agreed to split the $10,000 among the top three competitors. Grits Co. and M A N A L L took second and third places respectively, while Australian-based DAYSWORK captured the top prize. Want to find out more about these brands? Follow them on Instagram! Interested in taking your own Skillshare workshop? Check out this list to see what we have coming up this fall.